Here comes #3 of my best practice blogs on the VJS, our Gantt chart add-in for easy project planning in the Microsoft Dynamics NAV jobs module. This time I want to show you how you can bypass a severe NAV shortfall of not being able to assign Job Planning Lines to Resource Groups. In essence, this does not allow to make a rough project planning when working with the standard jobs module. Once again, you could wonder whether a small feature like described below is worth a whole post. But see for yourself how much your planning will be made easier by just a string of characters and by then being able to combine rough and fine planning within one planning board. If you start planning a project, you often know which type of resource you will need to perform a task. However, if the project still is some time ahead, you typically do not want to already decide which concrete resource will carry out that specific task. Instead, you want to do a rough project plan first. You can only assign Job Planning Lines to resources, not to resource groups. But don't despair - we have solved your problem. Create a dummy resource the number of which starts with “$VJSRG$”. The resource name you enter here will be shown in the table. Start with rough planning while not having to draw up your plan down to the smallest detail. As the fine-tuning nears its completion you can reassign the workload to the actual resources. More best practice wanted? 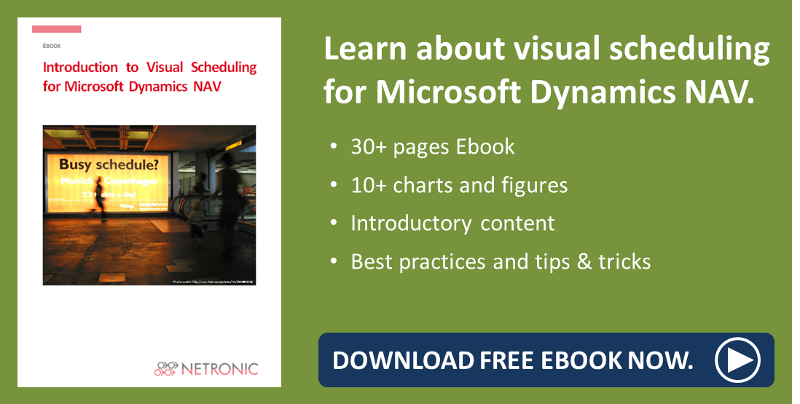 Read about moving complete Dynamics NAV jobs in the Visual Jobs Scheduler by just one click.